With an average 5.4 acres (2.2 ha) an hour of mowing capacity, and CrossTrax® all wheel drive system, the 4300-D delivers unsurpassed performance and value. CrossTrax® All-Wheel Drive: Based off our patented series/parallel 3-wheel drive kit, the CrossTrax® system automatically transfers power from the front tires to the opposite rear tires to minimize spinouts and maximize traction on wet terrain. ROPS and seatbelt included. High Height Blade: A new higher height of cut blade is now available in addition to the standard blade. This blade creates more lift and should be used in higher height of cut application. While there is no absolute height where the blade should be used, it should generally be used beginning at 2-1/4" (5.7 cm) or 2-1/2" (6.4 cm) height of cut. Powerful Kubota Engine: The Kubota® 60 hp (44.7 kw) turbo-diesel liquid-cooled, 4-cylinder engine provides an abundance of power to handle the most demanding mowing conditions. 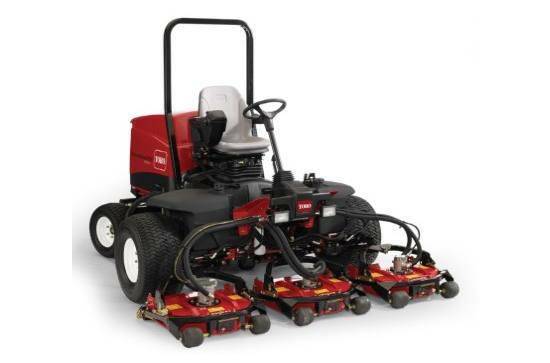 The 4500-D and 4700-D are the most powerful mowers in their class, with 117 ft-lbs (158.6 N) of torque at 58 hp (43.3 kw) net and normal engine speed of 2600 RPM. Operator Comfort: All of the indicators and controls to operate the unit are conveniently located on the right armrest. Control console pivots back for right hand entry and exit. Tilt steering, deluxe suspension seat, improved visibility and lower operating noise enhance the operator experience and help to reduce fatigue.